TechnoKids has just released TechnoHTML5. In TechnoHTML5, students became web designers. Using HTML and CSS they develop a web page with text, graphics, and hyperlinks. Upon completion, the files are uploaded to the Internet. 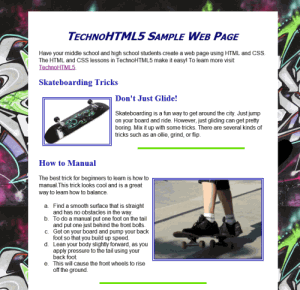 Your students begin by editing web page templates provided with TechnoHTML5 to learn HTML elements and CSS attributes. Afterwards, they complete the assignments to build their own web page. TechnoHTML 5 includes assignments with step-by-step instructions. There are also assessment tools such as reviews, skill reviews, checklists, and marking sheets. In addition, enrichment activities are included to challenge your students. When you order TechnoHTML5 you receive a teacher guide, workbook, and resource files. For students in a paperless classroom, the workbook is divided into individual assignments to use digitally. Teach the latest code. 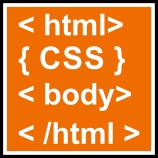 Many HTML tags you used in the past have been depreciated, soon they will no longer work. CSS! Cascading Style Sheets (CSS) are the new way of styling web page content. Go digital. Student workbook is divided into individual digital files for paperless classrooms. Spark an interest in programming. New enrichment activities challenge your students. Everything you need to teach. Expanded resources offer more templates, samples, and assessment tools.